Indeed, there is one Canadian organization that is attempting to turn our cultural fascination with celebrities, and mothers, on its head. The Toronto-based organization WoodGreen Community Services recently teamed up with an ad agency to create a media campaign to raise awareness about their award-winning programme Homeward Bound which helps single mothers out of poverty. The four year “job-readiness” programme supports single mothers, and helps them find affordable housing, childcare, and acquire the skills necessary to become self-supporting, typically through encouraging them to gain an education or vocational training. Their YouTube page contains a number of videos of “graduates” and current students, sharing their stories, and how the programme has benefitted them and their children. 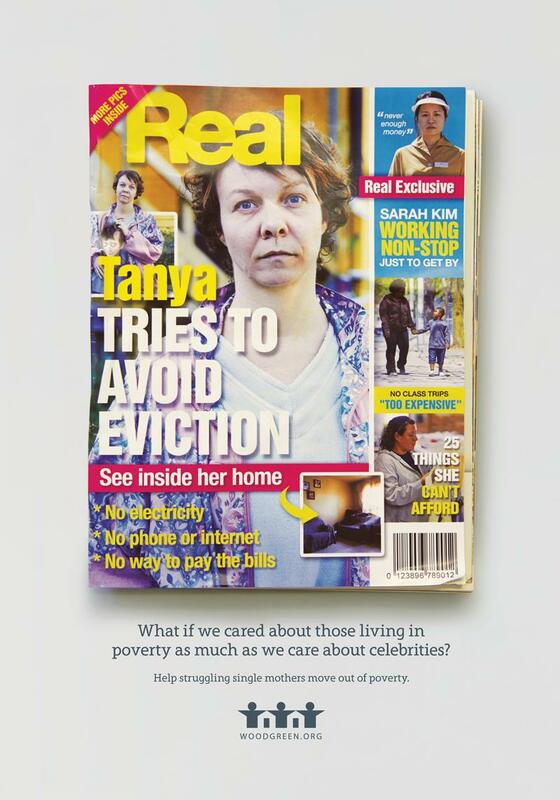 The campaign has garnered media attention for its creative and subversive use of the codes and conventions of celebrity gossip formats to raise awareness about single mothers living in poverty. 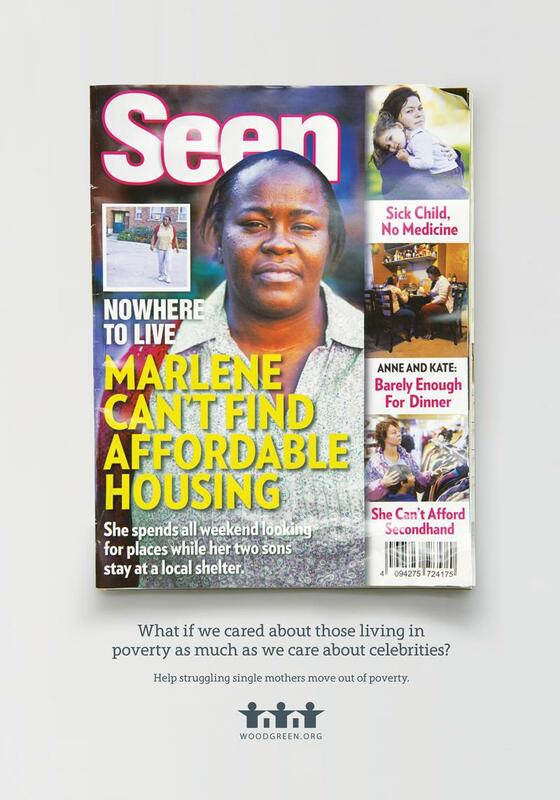 For instance, the campaign uses the tagline, “What if we cared about those living in poverty as much as we care about celebrities?” which draws attention to our insatiable appetite for celebrity gossip. Indeed, it seems fair to ask why it is that we know more about Hollywood celebrities than the people in our communities, and their everyday struggles and challenges. On the surface, this campaign raises a number of valid points about our consumption of celebrity. Indeed, critics of celebrity culture often argue that our fascination with celebrity takes attention away from more worthy causes, and social justice issues. For example, in the images shown, which can be found on the organisation’s website, we see parodies of typical celebrity magazine covers but instead of headlines focusing on the typical fare of babies, beauty, and bodies, the covers highlight the everyday lives of poor single mothers. 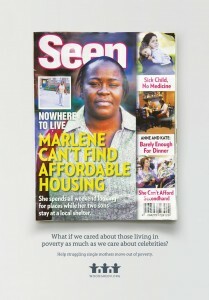 As these fake covers suggest, the “reality” for these women is a life of economic hardship (can’t find housing, can’t even afford thrift shops) but also a life made more difficult through a lack of adequate community support, and social policies that fail to address the needs of women such as affordable and accessible healthcare, childcare, and education, and well-paying employment opportunities. Thus, these images in some way help to “correct” the images of women that we are bombarded with on a daily basis by showing us images of the average woman in Canadian society who is hardly living a glamorous life but instead, is probably worrying how she is going to pay the bills and feed her children. As alluded to at the outset, the media’s contradictory messages about mothers are further fuelled by neoliberal discourses of personal responsibility and individual choice which tend to hold up celebrity mothers as the idealised model of contemporary motherhood. Angela McRobbie and others have argued that this new maternal paradigm equates good mothers with celebrity mums who are wealthy, with nannies, while bad mothers appear unkempt, poor, and usually single. Women of colour and poor women can only become “good mothers” if they adhere to, and successfully perform the dominant model of femininity which is coded as white and middle class. Therefore, this campaign, through its positioning of image and text, reproduces a class and race-based narrative that (inadvertently) places these women in opposition to “good” celebrity mothers. These poor single mothers are indeed the “other” to the white, wealthy women with nannies; who do not need help from the state to get ahead. The creative team knew they had to come up with something thought-provoking to grab people’s attention. It’s not that people don’t care about poverty, Rossetto said, but there are a lot of organizations vying for attention and donations. “It’s hard to be the cause that gets people really interested. And what we tried to do was tap into what’s going on in the culture,” she said. This hardly comes as a surprise, given the ongoing cuts to government-run social programmes that often help those that need it the most, primarily women and children. Yet, drawing on this strategy similarly subjects these women to the same discursive framework that positions celebrity mothers as either “good” or “bad”. Celebrity gossip discourses tend to reduce complex social problems such as racism and sexism to easily digestible cultural narratives that reinforce individualism over collectivity, and instead put the blame on women for their particular circumstances. All of this is to suggest that, while this campaign certainly brings much needed attention to the issue of single mothers and poverty, it also reveals the limitations of using celebrity culture to frame complex social and economic issues affecting women. Natasha Patterson teaches in Women’s Studies at the University of Northern British Columbia, Canada. Her PhD study explored women’s narratives of reality TV participation and the methodological implications such work poses for feminist cultural studies audience research. She has published in the areas of postfeminism and celebrity culture, gender and horror film, and online pedagogy. Her Twitter account is @TVapologist.